An exciting new book in the series featuring woman-on-the-run Elizabeth Miles--from the beloved national bestselling author of the Gaslight Mysteries. Elizabeth Miles knows that honesty is not always the best policy when it comes to finding justice. Elizabeth has discovered that navigating the rules of high society is the biggest con of all. She knows she can play the game, but so far, her only success is Priscilla Knight, a dedicated young suffragist recently widowed for the second time. Her beloved first husband died in a tragic accident and left her with two young daughters—and a sizable fortune. While she was lost in grief, Priscilla’s pastor convinced her she needed a man to look after her and engineered a whirlwind courtship and hasty marriage to fellow parishioner Endicott Knight. Now, about nine months later, Endicott is dead in what appears to be another terrible accident. Everyone is whispering, but that is the least of Priscilla’s troubles. She had believed Endicott was wealthy, too, but her banker tells her she has no money left and her house has been mortgaged. He also hints at a terrible scandal and refuses to help. Priscilla stands to lose everything, and Elizabeth is determined not to let that happen. But, as always, Elizabeth walks a fine line between using her unusual talents and revealing her own scandalous past. Elizabeth soon discovers that Endicott’s death was anything but accidental, and revealing the truth could threaten much more than Priscilla’s finances. To save her new friend’s future—and possibly her own—Elizabeth, along with her honest-to-a-fault beau, Gideon, delve into the sinister secrets someone would kill to keep. Grifting, blackmail, murder, robbing a mother with two children, prostitution plus more make for an exciting, well written, well plotted story. The story is set in the 1920s. Elizabeth Miles is a con artist who is in the process of reforming her ways. She is trying to do this due to her relationship with the uptight, upright lawyer..... Gideon Bates. Elizabeth is also trying to learn and live life according to society’s rules of etiquette. Elizabeth meets Priscilla Knight, a two time widow with two young children. Helping Priscilla by reviewing her husbands finances, Elizabeth discovers a scam has happened to the widow. This scam has left her penniless. After discovering the scam, Elizabeth starts to investigate. Seems blackmail and murder have happened by how will Elizabeth help get money back for the widow. It is necessary for a con artist to outsmart the murderer and scam artist. This is a fun, entertaining, interesting and intriguing read filled with deadly secrets. Although this is book # 2 of the Counterfeit Lady Mystery series, it can be read as a stand alone. The author mixed the past and present together effortlessly so the characters are easy to get to know. I volunteered to read City of Secrets. Thanks to Penguin’s First-to-Read fit the opportunity. My opinion is my own. Tbh If you are wondering what happened to E]izabeth, this book will tell you. It's about blackmailing. 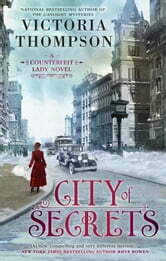 Book one in this series, City of Lies, gave us a good history lesson about the Women’s Suffrage movement. This second in an, I hope, ongoing series digs down into more of the interpersonal relationships of Elizabeth, Gideon, and their families and friends. It also has more of a mystery than the first book. Elizabeth’s new friend, Priscilla, has been taken to the cleaners by her recently deceased husband. All the money she had from her first, loving, marriage is gone. She and her daughters will soon be destitute. Elizabeth, the con artist, and Gideon, the most honest man ever, work together to find out why the money is gone and who perpetrated this dastardly deed! Lots of intrigue, although the mystery was pretty easy to figure out. Although not as rich in historical details as the first book, still a great read. I’m loving this series and can’t wait for the next installment.